Metal Buildings for RV and Boat Storage Prefabricated kits are cheap and easy to assemble! U.S. Buildings’ steel building garage kits and prefabricated garage kits are a great choice for storing and protecting your boat or RV from the possibility of theft and damaging elements. Our fully customizable garage kits can be used as an additional garage for your home, or as a spacious unit to store your RV, boat or personal watercraft. 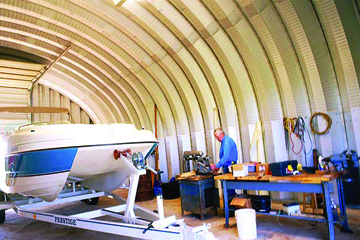 U.S. Buildings garage kits feature column free interiors and can span up to 200 feet, allowing for easy maneuverability and parking of your RV or boat. Because our buildings can be erected in less time than a traditional construction building, you end up saving on time and money! U.S. Buildings is a factory direct, American company with a long tradition of excellence, leadership and value in the industry. All of our products are backed by a 35 year limited warranty direct from the steel mill and have been through thorough, rigorous testing at independent labs, so our quality is unmatched.